Recently I had the great pleasure of teaming up with friend and colleague Tammy Lenski to deliver a workshop at the Annual Conference for the Association for Conflict Resolution’s New England Chapter. Our workshop was designed to introduce mediators, arbitrators, and others in the conflict resolution field to digital tools for managing, marketing, and delivering services in an ADR practice. Tammy and I selected our favorite tools and put them together in a handbook for workshop participants. We had three criteria for selecting the tools that made it into this handbook: 1) ease of use; 2) no special tech skills or knowledge required; and 3) free or affordable. We realized though that this stuff was too good to keep to ourselves and the people who came to our workshop–so we decided to share it with the web-surfing world. 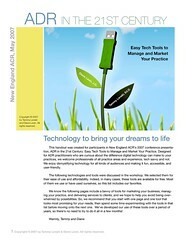 In PDF format for you to download is ADR in the 21st Century: Easy Tech Tools to Market and Manage Your Practice. Tammy and I hope that you find it useful. And if you have your own favorite digital tools that make your life as a mediator easier, please let me know. This entry was posted in Cool Stuff on the Web, Tech and Business Tips for Mediators. Bookmark the permalink. Thank you for compiling that information- looks like it will be very helpful as I try to grow my practice.